The Michigan government has jurisdiction over a wide array of health policy issues. From the regulation of insurance products, to oversight of the state’s Medicaid program, to investing in local public health efforts, Michigan policymakers craft policies and budgets that impact the health of millions of Michiganders. 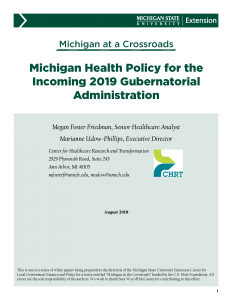 This brief will provide an overview of four key and timely health policy topics: Medicaid and the Healthy Michigan Plan; the individual health insurance market and the Health Insurance Marketplace; the opioid epidemic; and integration of services to address social determinants of health. It will explore some of the forces influencing our state’s health and discuss policy approaches to today’s health and health care issues.